I’ve been around long enough to have seen many changes. I’m from the pre-internet, 3 terrestrial TV channel generation so I’ve learnt to embrace and even welcome change. I’ve even been known to wander round muttering “change is good, change is good”. Sometimes, however, change is just so blatantly and utterly wrong that you can do nothing but shout “WTF?” out loud and have a jolly, good rant about the sheer stupidity of it all. Which brings me to McVitie’s Digestives and the reason why I was wtf’ing in my local supermarket recently. Throughout my life there have been a few constants, a few things that I feel I can rely on. One of those has been the McVities’s Digestive. Sure I’ve consorted with Custard Creams, buddied with Bourbons and even hung around with the odd Hobnob but I’ve always known that I’d come back to the humble Digestive. It’s pretty much the perfect biscuit. It’s got good crunch and a taste of its own; so many biscuits can manage the former but not the latter. It’s the right size, not too small that it’s gone in one bite. I’ve even been known to buy mugs based on their suitability in relation to the size of a digestive, which bring me to my next point. Dunking! It’s the perfect biscuit to dunk. It soaks up just enough liquid and is hardy enough not to disintegrate immediately, unlike that pretender the “Rich Tea” which has the ability to turn from firm disk to sunken sludge in a nanosecond of inattention. No the Digestive reigns supreme as a dunker! That’s not all though, it also works incredibly well with a good strong cheddar and as a carrier for many spreads and dips. So what has changed? What has happened to the king of biscuits to make me put fingertip to keyboard? Fortunately nothing has happened to the biscuit itself, it’s the packing that has changed and certainly not for the better. Until recently, the king of biscuits had the perfect packaging. Basically a nice tight fitting tube, and for quite a few years now, a simple ‘tear here’ tag to help take the top off, although those of us who remember back to pre-tag days prefer a knife. Forgive me if you’re an old hand but let me show you how perfect the packaging was. Then if you pull on the tag or take a knife you can slice down between the biscuits and remove the top. 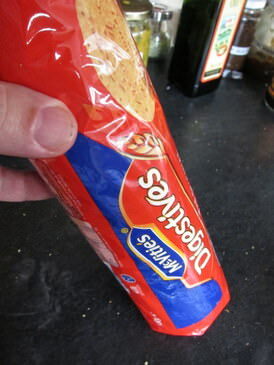 Now take the biscuits out of the top section you just removed and an additional biscuit from the main pack (like you needed an excuse), turn the empty top over and it fits exactly back into the main pack. It fits so well that it forms sufficient seal to maintain the quality of your biscuits. No soggy digestives for me. This, my friends, is design at its best, simply perfect. Pop the pack back into cupboard to wait patiently for your next cuppa knowing your biscuits will still be fresh and crunchy on your return. 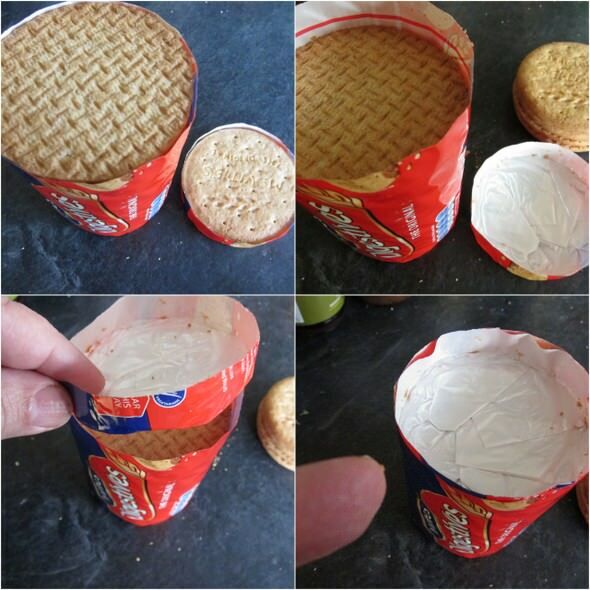 Remove biscuits, turn top over and replace for the perfect seal. So why was I ‘wtf’ing’ in the biscuit aisle? Well just look what they’ve gone and done! Now the packaging looks like something better suited a Christmas cracker. I can only assume that McVitie’s must have decided that the ability to read the word ‘tear’ and perform the action is too much for the majority of their customers. Not only that but they must think that the only thing their customers can manage to open is a packet of crisps! An End Better Suited to a Christmas Cracker! The other crazy aspect to this new design is that they have made it impossible to stand the packet up. Now all you can do is let it lie on its side, where not only is it taking up more cupboard space but it’s in constant danger of rolling out when you open the cupboard door. Instant broken biscuits! Some things just don’t need changing! I was about to send a complaint to McVities regarding their digestive packaging when I came across your page. This problem has been bugging me for some time but I keep getting told I am the grumpy old man with too much time on his hands. Your absolutely correct on all your comments. Everything I wanted to say is there and I feel a heavy weight has been lifted from my shoulders. Nuff said off for cup of tea and some broken digestives. Well I wrote to Mcvities about the change of taste. 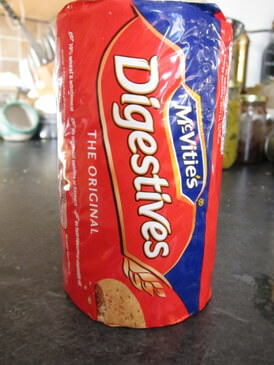 The digestives just are not the same to me… little crunch and less taste. They acknowledged. I now buy Lidls. I heartily agree about the packaging. But I have a strong suspicion the recipe has changed again. Two other afficionados I know reckon the same. First, I’m sure it’s less salty than it was. Second, it’s harder, more ‘snappy’. The flavour seems less intense in a harder biscuit. Whatever McVities claim, I don’t believe it’s the same biscuit! I must admit I was so miffed I’ve hardly bought them since they changed the packaging. So I can’t comment on the recipe. Next time I’m in the biscuit aisle I might be tempted to grab a pack and do a taste test. Well I am unhappy with both the taste and the new packaging!!! 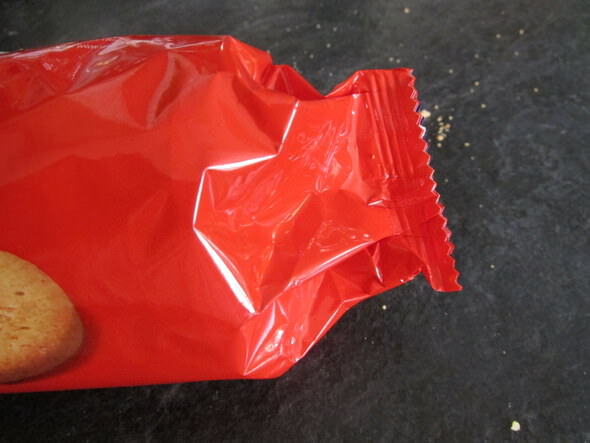 This biscuit is definitely not like it used to be, it’s smaller, thinner, crisper and less tasty, won’t be buying anymore, and packaging is terrible now, I couldn’t open it, then it ripped halfway down the packet……why can’t things be left alone!!!!! Also kit Kats not same anymore!!!! !